USB Squid LIVE From LAS VEGAS! | OhGizmo! USB Squid LIVE From LAS VEGAS! That’s right, we’re coming at you LIVE from… Gate B23 at McCarran Airport where I’m waiting for the continuation of my flight which has been delayed until like 3am. If I press my nose against the glass of the waiting area, I can catch a tantalizing glimpse of the strip off in the distance. Sigh. Seeing as I have a whoooole bunch of time on my hands, I thought I’d take this opportunity to introduce a USB drive in the shape of a squid. The Mimi-Ika drive from SolidAlliance (makers of the delicious spaghetti USB port, among other bizarre USB accessories) has 512MB packed into it’s betentacled body, with the head separating to reveal a USB 2.0 connector. Some diligent readers may have noticed that the source article calls this a “cuttlefish drive,” so after the jump, I will spend my layover explaining the difference between squid and cuttlefish and why various anatomic features confirm that this is indeed a squid drive. Both squid and cuttlefish are cephalopods, which are a class of salt water mollusks with tentacles. Cephalopods also include octopuses and the nautilus, which is the only type of cephalopod with a shell. Moving right along, the most notable difference between cuttlefish and squid is that cuttlefish has a bone (called, you guessed it, the cuttlebone) which is used to control buoyancy (squid maintain neutral buoyancy chemically, with ammonium). So let’s examine our USB drive. Umm, it’s got a USB connector in there, but I don’t think that counts. Next! Since actual cephalopods don’t have flash memory, let’s concentrate on the exterior. Squids and cuttlefish are anatomically similar, with eight arms and two longer tentacles, a beak, and skin that changes color (check out this video of octopus camo). The most easily identifiable differences are probably in the mantle (the body piece) and in the eyes. Cuttlefish have a fin that wraps all the way around their mantle, while squid have more discrete “wing” fins on either side of the mantle. And although both cuttlefish and squid have excellent eyesight, cuttlefish have eyes shaped like a smooth “w,” while squid eyes are usually round or flat. 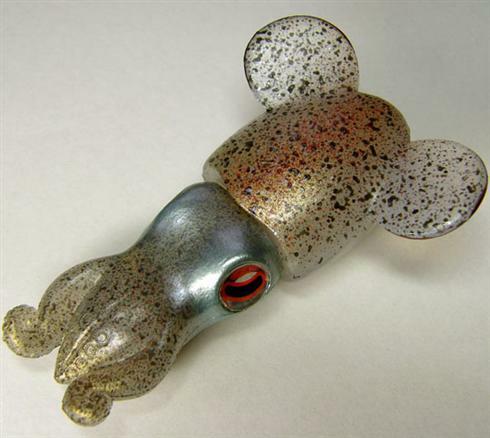 So, based on the eyes and fins, I am prepared to classify this USB drive as a squid rather than a cuttlefish. In general, if you encounter something that looks like this drive in the wild, remember that squid tend to be longer, larger, and more streamlined, while cuttlefish are fatter and have shorter arms and tentacles, and are most often found in shallower, warmer water. OhGizmo: your source for USB marine biology. Damn, all that and I still have another hour to kill. Ooo, slot machines! Maybe I can win enough money to be able to afford a direct flight next time. Is this day of strange posting?